MedaPoint is a cloud-based and mobile ePCR solution for EMS organizations. By simplifying manual processes and data retrieval, MedaPoint AdvanceCare™ eliminates redundancy and maximizes accuracy. Users are enabled to make intelligent, real-time decisions about patient care, improving efficiency and increasing the organization’s ROI. Mobile access empowers users in the field to capture data offline on any Android/iOS/Windows 10 mobile device during periods without Internet access, and then to access it later from any browser-enabled device. The easy-to-use interface allows for quick data capture in both real-time and post-event documentation efforts. Intelligent data mapping eliminates redundant fields, while data capture mechanisms minimize steps. MedaPoint AdvanceCare™ can share information with other healthcare platforms such as hospital EMRs (electronic medical records), cardiac data studies, trauma databases, and STEMI databases. Industry standard data tools allow for seamless integration and processes capable of two-way data sharing. Automatically export ePCR forms for claims processing and state data reporting. AdvanceCare’s enhanced NEMSIS 3 platform automates the accurate and timely submission of state data, and streamlines claims handling by creating more complete information gleaned from the configuration and data capture features. MedaPoint’s ePCR platform is customizable and scalable. Customizable ePCR forms are designed to scale documentation requirements to accommodate data collection for applicable service types, including round trips, wheelchair transports, and community paramedicine responses. Also included is multi-channel communication—including SMS and voice notifications, configurable operations, and personnel email and text alerting—among field staff, office staff, patients, and facilities. 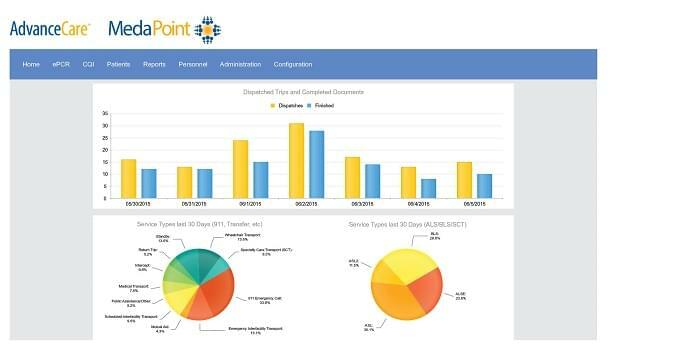 Documentation in AdvanceCare™ triggers two-way communication with AdvanceDispatch™, which allows the ePCR to function as a mobile data terminal (MDT) in connected environments. Patient data can be recalled in real time for clinical decision making. Auto-search features allow information such as insurance payers to be added and updated quickly. Administrative controls allow for configuration to ensure HIPAA security and compliance. Not sure MedaPoint is right for your business? Use our EMS Software Product Selection Tool to compare other EMS Software solutions. Have questions? Call or email one of our unbiased Technology Advisers for a free consultation. Learn everything you need to know about MedaPoint. Our experts will reach out to you shortly.